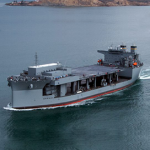 The U.S. Navy has named its latest Expeditionary Sea Base ship under contract with General Dynamics‘ shipbuilding business as USNS Miguel Keith. Secretary of the Navy Richard Spencer said the vessel designated T-ESB 5 is named after the late U.S. Marine Corps veteran and Medal of Honor awardee Miguel Keith, the Navy said Saturday. The future USNS Miguel Keith is designed to aid multiple missions including air mine countermeasure, counter-piracy, maritime security, humanitarian aid, disaster relief and crisis response. The Navy said the 784-foot-long vessel is anticipated to board 250 personnel and support MH-53 and MH-60 helicopters on its 52,000-square-foot flight deck with an upgrade option to accommodate MV-22 tilt-rotor aircraft. T-ESB 5 will feature fuel and equipment storage and spaces for repairs and mission planning. General Dynamics NASSCO started construction on the fifth ESB ship under the Navy’s Expedition Transfer Dock/Expeditionary Sea Base program in January and is expected to deliver the ship by 2019.